So, the company's squad of droid smartphones is now complete with a QWERTTY messenger. It's the kind of phone that can enjoy demand from both business users and social networking fans. The entire Xperia lineup was thoroughly refreshed and ready to offer the Android experience to users of all backgrounds and ages. It was recently confirmed too that all the company’s recent smartphones would get the Ice-cream Sandwich update. Sony Ericsson should probably next focus on future proofing the hardware as well. Although still a rumor at this point, a dual core phone with an HD touchscreen is already in the works. And who knows, it may be Sony without Ericsson to announce the next flagship. But well, that’s for the future to tell. Away from flagships – and speculations – the Xperia pro is here and now and more than decently spec'd for the intended audience. The screen size and resolution are more than adequate, the QWERTY keyboard is great. There’s a solid office and organizer package right out of the box – and the Android Market is the limit. The social and imaging skills are not just a bonus, they add an extra dimension. Even without dual core under the hood, the Xperia pro is by no means underpowered. And it can squeeze more life of the 1500mAh battery. QWERTY messengers may seem to have gone out of fashion but Sony Ericsson beg to disagree. They have two of them but different enough to pull in different demographics. If you're in Europe and want meaningful competition, you need to roll all the way back to the Desire Z and the Milestone 2. They’re both already running Android 2.3 Gingerbread and the more recent Motorola MILESTONE 2 even manages to match the screen resolution and processing power of the pro. The Xperia messenger doesn’t have the aluminum unibody of the Desire Z or the solid feel of the Milestone. It offers an 8MP camera instead. 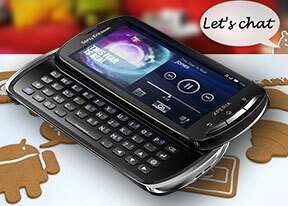 The Nokia E7 is another option and it’s soon to get Symbian Belle. We were impressed with the latest update of the OS and it’s certain to make a difference to an already solid business package. The E7 boasts a ClearBlack AMOLED screen, USB-on-the-go, HDMI and penta-band 3G. The anodized unibody and lifetime sat-nav license are welcome too. If you’re shopping for a QWERTY messenger, Sony Ericsson have the most recent models. The competition seems less interested in this form factor. And the different styling tells a lot about a changing market. Old school is cool: the metal-clad messengers of the older generation are solid and physical, more grown-up. But strictly business will no longer do. The Xperia Pro has the business acumen but it’s not the nine-to-five type.